Under her direction, various key Hispanic events have launched and are now celebrated annually, such as the Three Kings Day Celebration. Norma plays an integral role in developing and carrying out successful communication strategy and media relations for Disneyland Resort’s campaigns. Including acting as a spokesperson in media interviews, she has established strong relationships with Hispanic media across the board both locally and internationally. 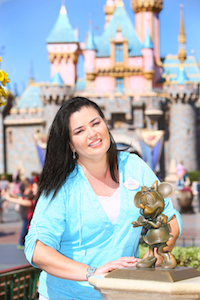 Norma joined Disney Destinations, LLC in 2005 after three-years at VPE Public Relations as Account Executive, an independent full service communications agency specialized in Hispanic consumer marketing, social marketing and public affairs. During her tenure, she contributed to various accounts such as Disneyland Resort prior to moving in-house. Whenever possible, Norma lends her time and expertise to the arts, an area she has a personal connection to, most recently to the City of San Fernando Mariachi Master Apprentice Program, who won the 2012 National Arts and Humanities Youth Program Award, the nation’s highest honor for after-school arts and humanities programs from The White House. Also, having formed part of Ballet Folklórico groups herself, Norma teaches a weekly class to a youth group. Born in East Los Angeles and raised in Guadalajara, México until the age of eight, Norma moved back to Los Angeles, where she currently resides as a mother of two and grandmother to her first granddaughter. Norma’s rich, multicultural background and experience has been instrumental in her work as a public relations professional.